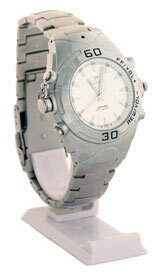 This handsome fully functional watch is also a media player with 256MB flash memory built in. This unique recorder will allow you to record up to 9 hours of voice recording and download MP3’s music files. Now you can record notes, reminders or listen to music without any other devices. USB plug and play make this the media player perfect for any situation in which audio recording is required. Play back via stereo earphones or window media player. WARNING! Photos- Copyright, Ralph Thomas, 2006.